All prices in Canadian dollars and subject to applicable taxes. Buy your replacement lamps from Projector Lamps Canada in confidence, knowing that your lamp purchase is protected against early bulb failure with a full included bulb warranty on each lamp you buy. As one of the leading authorities in Canada on replacement projector lamps, TV lamps, interactive whiteboard lamps and SMART Board lamps, at Projector Lamps Canada we stand behind the replacement lamps we sell. We are proud to include a free of charge 120 Day Projector Lamps Canada Bulb Warranty with every replacement lamp we sell. That’s the longest replacement lamp warranty around! 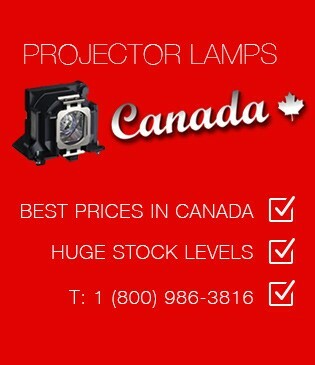 If a lamp you buy from Projector Lamps Canada fails due to a manufacturer defect within 120 days of your purchase, Projector Lamps Canada will replace it – free of charge. Click here for our full replacement bulb warranty terms and conditions. For projector bulb and TV bulb customers in Canada who would like the added peace of mind of an extended replacement lamp warranty, Projector Lamps Canada offers a comprehensive six month lamp and bulb warranty for an additional $39.99. This extended replacement lamp warranty (which must be purchased at the same time as the lamp) covers your bulb against early failure for a full six months after your purchase. If you would like to add an extended projector bulb or TV bulb warranty to a lamp you plan to order from Projector Lamps Canada, you can do so easily when you add a replacement lamp to your online shopping cart. First off, find the projector lamp or TV lamp you need. When you arrive on the correct bulb information page that contains details like pricing and stock levels, make sure you check the "add extended warranty" box before you add the lamp to your cart. Projector Lamps Canada has a fast and simple warranty returns process that minimizes the time you are without a functioning lamp/bulb. If your projector lamp, TV lamp or interactive whiteboard lamp fails under warranty (either the standard 120 day warranty or the extended 6 month option) the first step is to get a lamp return number by visiting our lamp returns page. Candian sales tax info: Alberta, Manitoba, N.T., P.E.I., Nunavut, Saskatchewan, Québec, Yukon: 5% GST. British Columbia (BC): 12% HST, New Brunswick: 13% HST, N.L. : 13% HST, Nova Scotia: 15% HST, Ontario: 13% HST. © Projector Lamps Canada 2009-2011.